When your car is damaged in an accident, you can’t trust just any body shop. You need a certified Mesa Chrysler body shop that has the skilled technicians and the advanced technology to perform the repairs to the highest quality so that your vehicle is restored to its former beauty and structural integrity. In many cases, your vehicle may even look better than before after a skilled auto body technician repairs it. Excel Collision and Glass Centers offers a certified body shop to expertly repair your Chrysler or Fiat vehicle. We perform all types of auto body repairs, ranging from minor paint touchups to replacing major panels. Excel Collision and Glass Centers maintains several auto body repair centers throughout Arizona so that you can find one that is nearest your home or work. We offer flexible appointment times as well as drive-up access. We do everything we can to help you find a time for your auto body repair that suits your busy schedule, while also trying to minimize the time that you are without your vehicle. Our friendly team will help you understand the options available for vehicle repair so that you can make an informed decision to get the best results. They will do it all while providing exceptional customer service in a comfortable environment. Excel Collision Center has years of experience in repairing different Chrysler’s car models, including other car companies they own like Dodge and Jeep. With our Chrysler factory certification, we prove that we only have the best manufacturer parts on the market. Aftermarket parts can be cheaper, but they won’t be as durable, and some of them may not be a perfect fit for your car. We have convenient locations in Mesa for you to leave your vehicle at any time with no time wasted. Chrysler has different types of cars that ranges from coupes and sedans to minivans and SUVs. Every Chrysler model has a different frame, so it needs different body parts for them. Thankfully, Excel Collision Center is prepared to handle any accident situation for all the models available from Chrysler. Our skilled workers will inform you step by step on the procedures we perform to restore your vehicle back to a pre-accident condition. With all the years of experience we have in collision repair business; we have perfected every procedure and equipment usage to remove and fix any dent, bumps, and surface damage from all Chrysler vehicle with the best efficiency compared to other collision repair companies. Our dent removal and repair services make your car’s body more durable. In hot temperatures, the sun can directly damage the paint of your car, but thankfully we are also able to restore it back. Go ahead and give us a call right now to find out more information about our affordable services. ✓ Provide the highest level of craftsmanship in any repairs that we perform, no matter how small or large. ✓ Perform whatever work is needed to return the vehicle to its condition before the accident. ✓ Get continuing education to stay aware of the latest methods for getting exceptional results in collision repair. ✓ Use the best tools and technology we can to provide the best quality repairs. ✓ Provide friendly service so that you always have a positive experience in our shop. ✓ Return phone calls and emails in a timely manner. 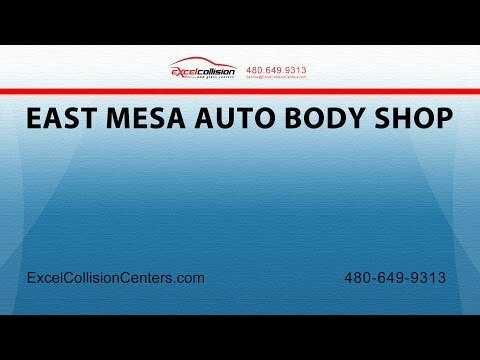 You’ll notice the difference that our service makes from the moment you call our Mesa body shop or any of our other satellite locations. We take our commitment to our customers seriously, and our consistent service has earned us a reputation as one of the best Chrysler body repair shops in Arizona. Your vehicle is too important to trust its care to just any shop. You need expertly trained technicians who are committed to providing the best service and the best workmanship, and that’s what Excel Collision and Glass Centers offers. We are committed to developing long-term relationships with our customers, and we stick to our promise. We are so confident in our work that we offer a lifetime warranty. Bring your vehicle into our Mesa shop as soon as possible after your accident to get an estimate and find out what we can do to get your vehicle looking beautiful again. "I have to say when I picked up my car I could not tell it had every been in an accident." "They were ethical, professional, and provided service with a genuine smile."